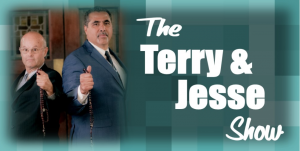 I was just on the Terry Barber & Jesse Romero Show and I gave them and their listeners a one-hour Virtual Tour of Jesus’ Passion from the Upper Room to the Burial Tomb. You can listen here. 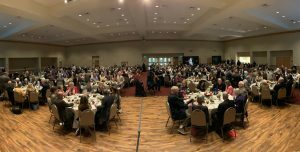 It was a marvelous fundraising dinner last night with Guadalupe Radio at San Antonio Texas. What a great group of energized, authentic Catholics who are working hard to make an impact on our culture. I am grateful to Richard Reyna, the general manager, and Toya Hall for the invitation. 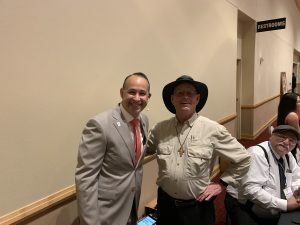 I gave my talk “Swimming Upstream“ and tied it into the necessity of Catholic radio, which I think is one of the most important things happening in the Catholic world today. We as Catholics are becoming a despised subculture, the underground society, almost the rebellion. Catholic radio calls us all together and energizes Catholics across the country. It’s too easy to be pushed down by a pagan world which says Christians are fools and should just shut up. It’s easy to withdraw and just keep it all in our heads. However, Catholic Radio reminds us all that we’re not the only ones. There is a movement out there and we are part of something bigger than ourselves. The day before I left for San Antonio I spent part of the day with Ave Maria Radio for their fundraising drive. Last week I was in Dubuque Iowa for a fundraiser at WCRD. If you can, please support your radio stations which can only survive with our donations. Fr. Mitch Pacwa from EWTN got in touch with me yesterday and asked me to come on EWTN Live to discuss my new book on the papacy. That will happen the end of July. Looking forward to it! Fight the good fight (1 Tim 6:12), never be ashamed of the gospel (Rom 1:16), seize heaven (Matt 11:12) and always be ready to give an answer (1 Pet 3:15) and do the work of an evangelist (2 Tim 4:5). Yes, yes, a thousand times. If we Christians are right in believing that salvation belongs to Jesus Christ, that it does not come from us–and that our hand cannot stop what God allows for us, then yes, there is hope in eternity even for those who take their own lives. The finality of suicide makes this all the worse. You cannot make things right again. Neither can [REDACTED]. And this is much of the pain of it all. Things are left unresolved, even if it felt to [REDACTED] like this was the only way to resolve things. You want to turn the clock back and say, “Please don’t give up. We can work through this pain together. ” But now you will have to work through this pain by yourselves, or with those close to you now who will need to lean on you even as you lean on them. On most people’s mind, however, especially of us who call ourselves Christians, on our minds as we sit in this place is: Can God forgive and heal this? Yes, God CAN forgive even the taking of one’s own life. In fact, God awaits us with his mercy, with ever open arms. Sacred Scripture says clearly: God proves his love for us in that while we still were sinners Christ died for us (Romans 5:8). God’s abiding mercy is what sets us to ask for it. Although God doesn’t dangle his mercy like a carrot, waiting for us to ask for it in order to receive it, we do have to believe in our hearts, express with our words, and show in our actions – that it is always there. God wants nothing but our salvation but he will never force himself on us, he will not save us without us. That’s how much he loves us. Because of the all embracing sacrifice of Christ on the cross God can have mercy on any sin. Yes, because of his mercy, God can forgive suicide and heal what has been broken. Read it all, with additional commentary, at Ed’s blog. Needless to say, if this text is accurate, this reads as something far different from what was described to the media a few days ago. This comes across as compassionate, catechetical, thoughtful — and uplifted by cautious, prayerful hope. Which is what a good funeral homily should be. While this isn’t exactly the feel-good homily some might have wished for, neither is it a fire-and-brimstone judgmental screed. I’d be curious to know where the text came from and if the family can confirm these are the words spoken at the funeral. What, exactly, do they take issue with? We’re left to wonder just what the family actually heard — and why an otherwise solid piece of preaching has become a lightning rod for anger and criticism. I’m excited to share Daily Catholic Wisdom with you! “Enemy occupied territory — that is what this world is. Christianity is the story of how the rightful king has landed, you might say landed in disguise, and is calling us to take part in a great campaign of sabotage.” C. S. Lewis For the larger context from Lewis’ Mere Christianity click HERE. An Excellent Summary of Christianity in China, and What in the World Is the Pope Doing? Out for our morning walk with my girlfriend of 41 years as the sun rises.